Researchers say they have taken a step closer to better understanding how the gut microbiome is formed, changes over time, and is affected by disturbances like antibiotics. 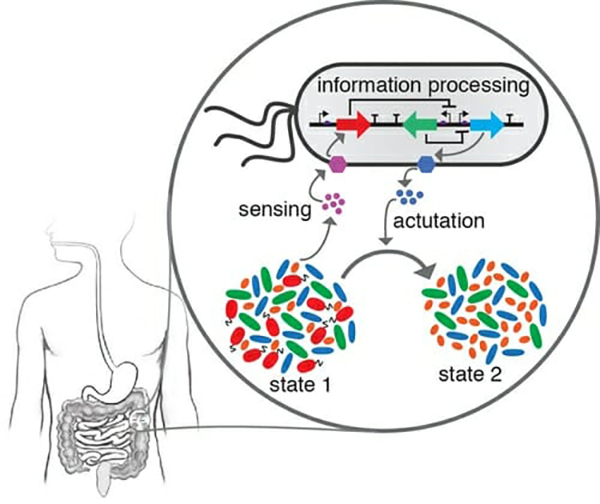 Published June 21 in Molecular Systems Biology, a study (“Deciphering Microbial Interactions in Synthetic Human Gut Microbiome Communities”) by a team from the University of Wisconsin-Madison and the University of California, Berkeley, describes a platform for predicting how microbial gut communities work and represents a potential first step toward understanding how to manipulate the properties of the gut ecosystem. This could allow scientists to, for example, design a probiotic that persists in the gut or tailor a diet to positively influence human health, according to the scientists. “The ecological forces that govern the assembly and stability of the human gut microbiota remain unresolved. We developed a generalizable model-guided framework to predict higher-dimensional consortia from time-resolved measurements of lower-order assemblages. This method was employed to decipher microbial interactions in a diverse human gut microbiome synthetic community. We show that pairwise interactions are major drivers of multi-species community dynamics, as opposed to higher-order interactions. The inferred ecological network exhibits a high proportion of negative and frequent positive interactions. Ecological drivers and responsive recipient species were discovered in the network,” write the investigators. By learning these rules, researchers say they can better predict interactions between microbes using computational tools instead of performing laborious and time-consuming laboratory experiments. The data can also start to answer questions about how pathogens cause damage when they invade communities, and how to prevent it. For the study, the researchers chose 12 bacterial types present in the human gut. They represented the diversity of the gut microbiome and the majority have been shown to significantly affect human health. They have associations with diseases such as diabetes, irritable bowel syndrome, Crohn's disease, and colon cancer. The team collected data on what are called pairwise interactions, which means each bacterial species was paired with just one other to study how the two interacted, without worrying about what all of the others were doing. This was done for every possible pairing in the 12-member community. The researchers fed data about the pairwise interactions, along with data on each individual species, into a dynamic model to decipher how all of the bacteria would likely interact when combined. They found the pairwise data alone was sufficient to predict how the larger community assembles. While this approach is still a challenge, Dr. Venturelli says it will significantly reduce the number of measurements scientists need to make. The researchers also looked at which species seemed to be the most important in the community by measuring metabolites. To their surprise, “the metabolite data was not able to predict the role of important species in the community,” notes Dr. Venturelli. The research team then tested the model's predictive power by trying to estimate the characteristics of different combinations of their 12 chosen bacteria. Although not perfect, the model did well at predicting dynamic behaviors. Additionally, the team found more positive interactions between microbes in the community than they expected based on other studies that have shown mostly negative interactions. The model allows the scientist to now begin to ask questions about the composition and dynamics of thousands of microbial communities.